Looks like Fleer used the same photograph two years in a row for Rick Aguilera. I'm guessing that because he only pitched in 11 games in 1988 that they didn't have a new picture of him, so they just cropped out the uniform jersey, the style of which was only used in 1987. 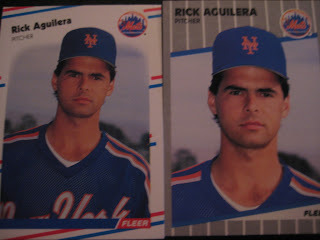 Its a good think the Mets traded him to the Twins in 1989 or we might have seen the same picture three years in a row.